Depilatories are cosmetic chemical compounds used for hair removal from the body. They work by breaking down and dissolving the hair follicle bond (at the skin surface); the applied chemical cream is then removed/scraped off, along-with the detached hair. Depilatory Poisoning is the accidental or intentional intake (swallowing) of any product containing the compound. What are the Causes of Depilatory Poisoning? What are the Signs and Symptoms of Depilatory Poisoning? The signs and symptoms of Depilatory Poisoning can vary from one individual to another. It may be mild in some and severe in others. Several systems of the body, such as the vascular system, digestive system, respiratory system, nervous system, skin and ENT may be affected. How is First Aid administered for Depilatory Poisoning? Who should administer First Aid for Depilatory Poisoning? 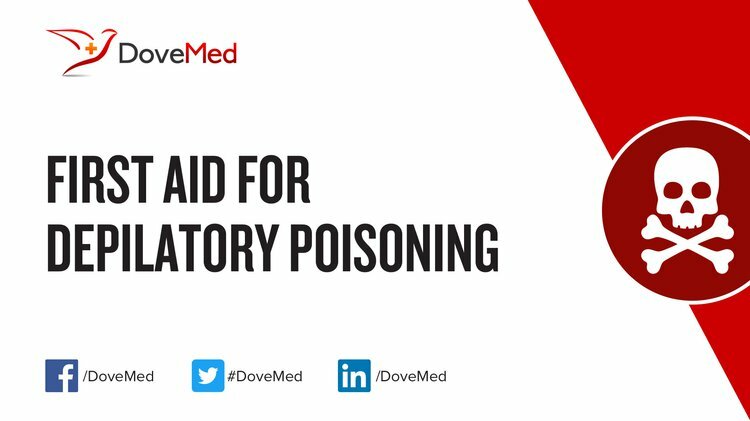 First aid for Depilatory Poisoning is administered by healthcare professionals. What is the Prognosis of Depilatory Poisoning? How can Depilatory Poisoning be Prevented? Mehrpour, Omid, et al. "Poisoning with depilatory agents in Iran." Journal of research in medical sciences 18.2 (2013): 168-169. Saravi, B. M. (2013). Prevalence of non-drug poisoning in patients admitted to hospitals of Mazandaran University of Medical Sciences, 2010-2011. Acta informatica medica, 21(3), 192. Tajoddini, S., Esmaeili, A., Hoseini, F., & Dadpour, B. (2016). A Rare Case of Acute Myocardial Infarction Associated with Arsenic Poisoning. Asia Pacific Journal of Medical Toxicology, 5(4), 130-131. Afshari, R., Mégarbane, B., & Zavar, A. (2012). Thallium poisoning: one additional and unexpected risk of heroin abuse. Clinical toxicology, 50(8), 791-792. Müller, D., & Desel, H. (2010). Acute selenium poisoning by paradise nuts (Lecythis ollaria). Human & experimental toxicology, 29(5), 431-434. Yartire, H., Hashemian, A. H., & Saleh, E. (2014). A View to Mortality Due to Poisoning Cases in Forensics Center of Kermanshah in 2006-2012. Adv Biol Res, 8, 157-61. Ghiasi, G., Hashemian, F., Kebriaeezadeh, A., Ghiasi, S., & Sheikhlar, A. (2014). Investigating the Knowledge of Pharmacists about Cosmetics Products in Pharmacies of Tehran (IRAN). Value in Health, 17(7), A792-A793. Jaiswal, A. K., Sharma, D., Krishna, K., Vidua, R., & Kumar, A. (2012). Thallium poisoning: Analytical aspects with brief overview. Journal of South India Medicolegal Association, 4, 68-75. Hughes, M. F. (2015). History of Arsenic as a Poison and a Medicinal Agent. Arsenic: Exposure Sources, Health Risks, and Mechanisms of Toxicity, 1.